Headed into the Missouri State Championship I found myself in a similar position to what I was in last year, where a Top 8 finish would clinch me the points needed to qualify for the World Championship, so the goal of Top 8 was the first and foremost goal. I entered the tournament with 259 Championship Points (compared to 250 last season), although 40 of these points were from the World Championships, so I was a bit behind the actual in season pace I was at last year resultant from doing slightly poorer at City Championships, League Challenge opportunities being diminished this season, and playing in one less Regional Championship at this point in the season. Even with the World Championship goal being at the forefront, what I really wanted to do is win the tournament. I think some times as competitive players we’re not always focused on the goal of winning tournaments and often are focused on things like making it into the top cut or just not embarrassing ourselves that we go into a lot of tournaments without the focus needed to properly execute the correct plays throughout the entirety of a tournament. Last year I had finished 2nd place at the tournament, losing to Charles Randall who expertly used a Donphan PLS/Primal Groudon EX list that he found somewhere on the internet to take down the tournament. That is somewhere as in here. Losing the finals in such a way is of course disappointing (as well as super cool to see someone else justify how you built a deck), and as such I wanted to do everything I could to make sure that this year had a different ending. 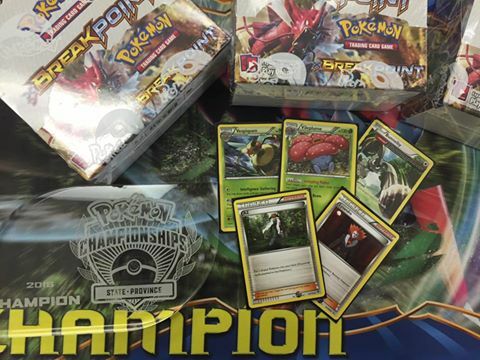 Headed into State Championships, the primary 5 decks that I was testing were Yveltal EX, Greninja BREAK, Entei AOR/Charizard EX, Darkrai EX/Hypno BPT, as well as various Vileplume variants. Later I narrowed in on Entei and Greninja, as I felt these decks generally beat most other decks and I managed to find ways to beat what would seem like bad matchups, such as Trevenant BREAK and Seismitoad EX with both decks. The one problem that I had with these decks was that even though they seemed like they should have great Night March matchups (and I was even playing Bursting Balloon in both decks), they still lost a good deal of games to Night March. In earlier testing against Andrew Mahone, these losses didn’t bother me that much because he is a highly skilled player, but when lesser skilled players started figuring out how to build their Night March lists and deal with certain matchups and started winning a fair share of games as well it became a more troublesome issue. On the Sunday before State Championships Vileplume/Vespiquen actually won a State Championship in the Phillipines. Josh Marking of Team Fish Knuckles, messaged me asking if it was the play. I said probably not and went back to testing Greninja. After another day of testing and a pile of losses to Night March I came to the realization that Night March was a legitimately overpowered deck and that to do well at State Championships you likely had to either play Night March yourself or counter it very hard. By Monday I was sold on playing the deck. On Monday we talked about some different ideas we had for the deck and ended up coming to a consensus on what should be cut out from the deck, but we diverged on what we wanted to add in place of certain things. Josh went for a super consistent build with 4 Professor Sycamore, while I went for a more teched out version of the deck. From there I poured all of my testing time into testing this deck and getting reacquainted with various matchups and figuring out how some of the new ones played out. I have already previously written about the original versions of the deck for both the Standard and Expanded format so I won’t waste time covering each and every aspect of the deck, although I will cover some thoughts on the general construction of the deck after the tournament report. The one card that we were in agreement in cutting was Red Card. While the card initially seems very strong, it’s usually not very impacting, and if you draw into it after the Item Lock has already gone up it’s a dead card. If your opponent starts 1 Pokemon, you’re only putting them at -2 card advantage, while if they bench 2 to start a game that’s only -1 card advantage, and if they start 3 it’s already down to 0 net change on their cards in hand. If you’re opponent goes first it can often help them more than it hurts them. The two new cards that I added to the deck were AZ and Lysandre, in place of the Red Card and a Professor Sycamore. 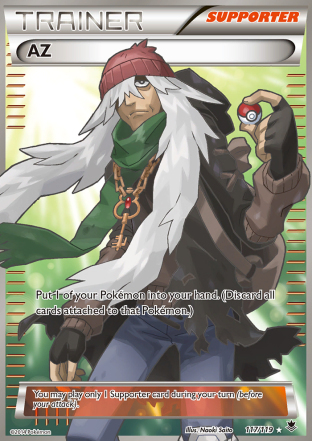 While the deck might seem inconsistent with only 2 Professor Sycamore, it is mostly fine. You generally only play 2 Professor Sycamore in a game, ideally one on the first turn of the game, and then after that I almost only play a Professor Sycamore on the last turn of the game to discard all the Pokemon I got out of my prizes. If you’re playing more than that I feel like you would deck out too much. I figured the deck may lose a game here and there because of the change, but it would probably not be any more than 1 game, so it was a change I was very willing to make. Additionally, AZ can act as a draw Supporter if you have a Shaymin EX in play. If you use AZ to pick up a Shaymin EX for draw it’s basically a Bianca, which is not that great of a Supporter, but in a deck like this you can play your hands in ways to generally get good draw from it. 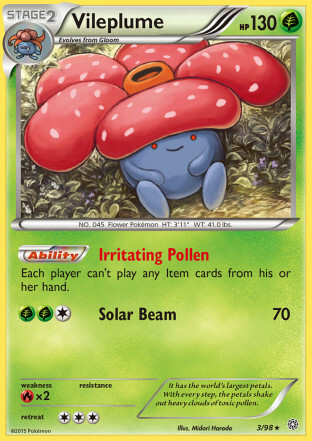 The primary purpose of AZ in the deck was to pick up Vileplume off the field. If you pick up Vileplume off the field in the mid game you can gain access to cards like Ultra Ball and Battle Compressor that you drew after the lock came up to boost your damage output or search out more Vespiquen or Combee. Additionally AZ allowed you to evolve into Vileplume without the Float Stone, knowing that you have an out to bail yourself out of game states that previously would have resulted in a loss. I really liked the idea of adding a gust effect in the deck. While playing the deck during City Championships and in previous testing I noticed a lot of close losses that could have been won if I was able to bring up an EX for two prizes. 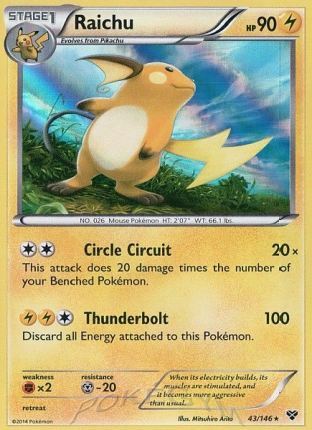 Additionally I noticed that players were starting to get very comfortable playing against the standard list for the deck and would make plays based around the idea that I wouldn’t be able to bring up a Pokemon from their bench. 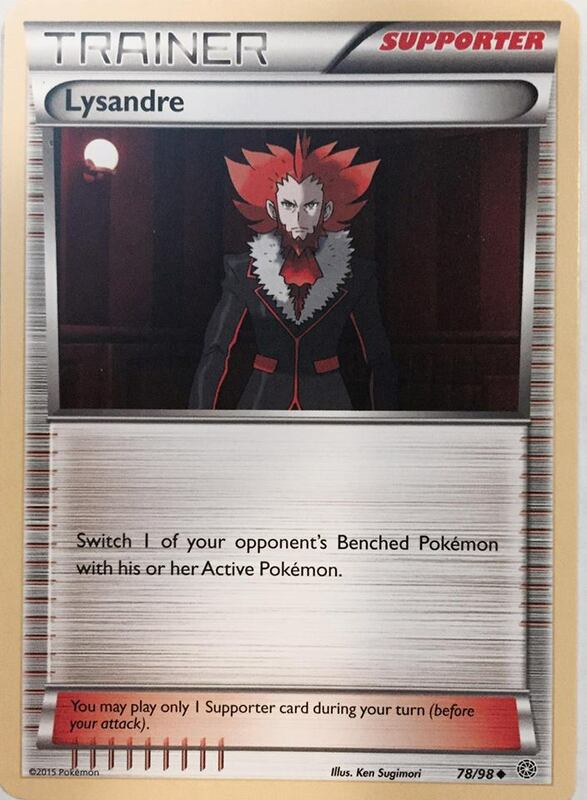 This allowed Lysandre to be used to disrupt my opponents by knocking out whatever they were trying to setup on their bench. 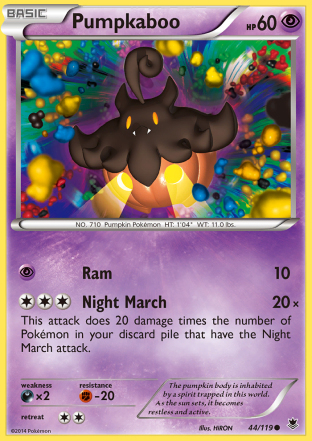 Additionally, if you ran them out of resources, like in the Night March matchup for example, you could Lysandre something up that didn’t have a way to retreat and deck them out with Bunnelby. One thing I liked about both of these cards was that they both provided ways to work around a Fright Night Yveltal locking a Vileplume into the active position. This year we would had enough people to play a 7 round tournament which then cut to a Top 8. We weren’t that many people over the trigger for a 7th round, so 5-1-1 would be a safe record for making Top 8 and a few 5-2 records would get in as well. In the first game he started a Pikachu and passed. 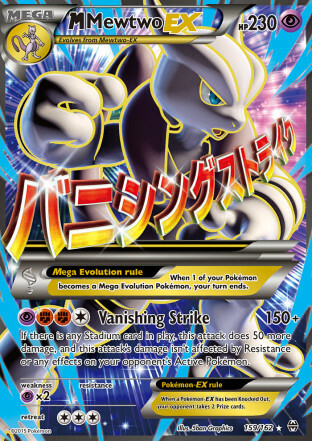 This made for an easy game as in any situation of your opponent starting a lone Pokemon to start the game and passing all you need to do is evolve into Vespiquen and take the knock out on the first turn of the game. 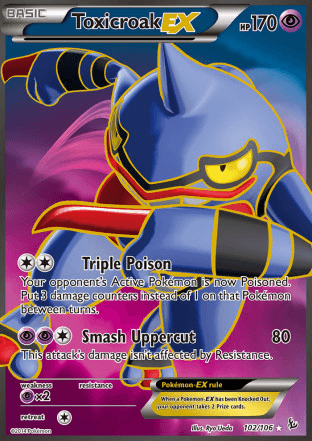 With the exception of Aegislash EX, there isn’t a Basic Pokemon in the format that you shouldn’t be able to knock out on the first turn of this game with this deck. I was able to evolve into the Vespiquen and find a Double Colorless Energy and take a quick win to start the tournament. In the second game he got much better draw and was able to setup some Raichu and bat lines. The game eventually reached a game state where he only had Crobat lines and I didn’t have access to a Vespiquen line. I did have AZ in hand, so I would be able to get Vileplume up and search out resources, but since I wasn’t under immediate threat I took the time to Rototiller Energy and Pokemon back into the deck and then Sky Return all my Shaymin EX so I didn’t have any easy prizes in play for later. I went down to a field of only Vileplume, and then on my next turn played down a Combee, used AZ to pick up Vileplume, played many of the Item cards in my hand to further setup, attached a Float Stone to my Oddish and then evolved back up to Vileplume and had a winning game state after that. My second round opponent was playing a M Mewtwo EX (X) deck. The M Mewtwo EX decks are genuinely strong decks that have struggled in the Standard format because of M Mewtwo EX’s Psychic weakness, which makes it very susceptible against Night March decks that attack with Pumpkaboo, but the decks generally have good matchups against everything that isn’t Night March. The tricky thing with this version of the deck is that you can in no way rely on 2HKO’s to win the game. The issue is the Damage Change attack which lets them constantly heal their M Mewtwo EX. Any time you damage it and they have Shrine of Memories in play they can switch all of the damage counters off of themselves and switch them with your Active Pokemon. Since they take OHKO’s on you, no damage ever comes back onto their Mewtwo, so if you fail to OHKO them they’re essentially taking a knockout and getting a Max Potion effect from their attack. In general against any Mega deck they will trade too favorably with you if you’re not taking OHKO’s, so against most of them it’s in your best interest to ditch the Vileplume line to maximize your damage output. In the first game of the series I could only get 14 Pokemon in the discard pile falling 10 damage short of knocking out his Mewtwo EX on the first turn of the game. From there I had a hand with all of my other Double Colorless Energy in it, and couldn’t draw into another Vespiquen line to get back in the game so I ended up scooping the game because I was going to lose. The second game was very easy because I went first which gave me two turns to get enough Pokemon in my discard pile for the first attack KO. I got it, and then was able to string OHKO’s together for the win. In the third game, I didn’t get that good of an opening hand and was forced to Lysandre a Shaymin EX to try to stall. He didn’t have the means to retreat it and mega evolved into M Mewtwo EX. I then took a knockout on his Shaymin EX to take the first two prizes of the game, and then he took a knockout on that Vespiquen. From there I was able to dig through most of my deck and was able to get 21 Pokemon in the discard pile to take the OHKO on the M Mewtwo EX. I had to discard pretty much every Pokemon that wasn’t already in play except my Bunnelby to get the KO, and it stretched me to the limit to hit all the resources needed to pull it off. After getting the KO and going up to four prizes taken there wasn’t really much he would be able to do to stage a comeback. This game had me very nervous because the matchups between turn 1 Item lock decks can go either way. Usually whoever wins the coin flip will win the match. My only out once I am Item locked is to hit my Lysandre to break the lock, and with only one Lysandre in my deck it was never a given that I would see it when being Item locked before taking a turn. I ended up winning the coin flip, so I instantly felt much better about the match. In game 1, I got turn 1 Item lock and easily won. In game 2, he got turn 1 Item lock and easily won. In game 3, I prized a Float Stone so I only had one in my deck to try to find and never found it on my first turn. I could have evolved into Vileplume, but chose not to in case I drew into the Float Stone or a way to get it on my next turn since I had Lysandre in hand to break the lock, attach the Float Stone, and then evolve into Vileplume. Additionally, since I already had a DCE on my benched Combee so if I didn’t draw a way to get into the Float Stone I could attach a DCE to Gloom, retreat it, and then evolve into Vileplume. However, he played a Red Card and I didn’t draw well off the Red Card and he was able to use Silent Fear continuously to get a fairly easy win. Evolving into Vileplume would have been sketchy anyhow, because while it would limit him from doing much, I would need to hit my AZ in order to get it out of the active position, and it’s impossible to know when I would have drew into it, and I probably would have been Item locked by the time I hit the AZ, which means I couldn’t play a Float Stone when I played it back down, whichmeans playing it back down would have put me at risk to losing to a Lysandre anyhow. This wasn’t a very competitive series since he gets Item locked in both games before he can get to a Stage 2, and then is relentlessly KO’d every turn of the game by my Vespiquen. In the second game, I did come close to decking because had a good amount of head flips on Froakie’s paralyzing Bubble attack. Eventually I worked through all the Froakie and was able to finish out the game. Night March is the entire reason that I am playing this deck, so I feel fairly good headed into this matchup and feel even better after winning the coin flip. In the first game, I get a turn 1 Item lock, he draws no other Pokemon on his first turn and then I knock out his lone Joltik. The second game is much closer as Night March can setup a game plan against you being able to have a turn of Item cards to start the game. He only draws into Joltik to start the game, which means that I can use Sky Return with my Shaymin EX for knockouts, both conserving my Energy and keeping two prize liabilities off the field. He does get a Lysandre and KO on my Vileplume to regain Items for the rest of the game, I believe on his second prize, but by that point in the game it doesn’t matter because I have all the resources I need for the rest of the game available to me to finish out the game. I have no Shaymin EX in play, or even in the discard pile to be put onto my bench with Target Whistle, so I’m in a great position to win. With the game tied at 3-3 on prizes I use my Lysandre, much to his surprise, to knockout his Shaymin EX and go down to 1 prize remaining. With two Vespiquen and my Bunnelby in play, there is no way I can lose the game, because as soon as I attack with Vespiquen, I win the game. If he tried to stall by bringing up my Bunnelby I could just attach and retreat. If he played an Enhanced Hammer and then used Lysandre on my Bunnelby, I could just Rototiller resources back in to setup a win a few turns later. This matchup probably shouldn’t be that difficult. You simply exchange 2HKO’s early with Manectric EX, while denying them much of a setup with Vileplume. In game 1, unfortunately I knew it would be difficult to get Vileplume out based on my opening hand and began discarding the entire Vileplume line with Battle Compressor. This seemed like it would be a fairly easy matchup to win by going turbo Vespiquen because you prize trade amazingly and they don’t have that much time to play down many Crobat lines. Additionally, in the later stages of the game, you can hold your Vespiquen line and play it all down at once with Forest of Giant Plants to avoid them taking damage before you evolve them. Little did I know he played Bursting Balloon, which allowed his deck to do more damage than his Abilities and attacks would suggest. The way I approached playing around this card was that if I was able to attack for two prizes, I would hit into the balloon, but if it was attached to something like a Crobat, I would use Sky Return with Shaymin EX or recover resources with Bunnelby. Since I didn’t have to devote a Float Stone to a Vileplume line I was free to use it on my Bunnelby and Shaymin EX for great mobility. I actually had to go the turbo Vespiquen route in both games because of awkward hands for getting the turn 1 Vileplume in both games, and it worked out in both games as my deck won the prize trade over his deck based solely on the Vespiquen aspect of my deck. 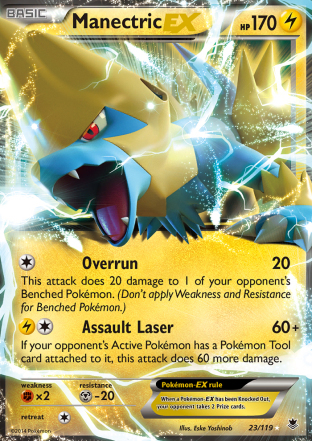 Manectric EX was a risky attacker in the matchup because I took two prizes any time he would attack with one of these, and then then Crobat and Golbat simply don’t do enough damage output to win a game themselves against a swarm of Vespiquen. This was a matchup where the Lysandre really shined because I could use it to bring up a Shaymin EX to accelerate the prize trade in my favor or knockout a Golbat on his bench before it could evolve into Crobat, denying him the 30 additional damage from Surprise Bite. We decide to intentional draw, putting both of us into the top cut safely. The game actually didn’t matter much in terms of making top cut, as I would have made Top 8, even if I lost my last round series, but the ordering of the seeding would have been different. Based on the matchups in the Top 8, I figured my path moving through the top cut would be against Brandon in the mirror match in Top 4, and then Conner in the finals with M Manectric EX. I figured whoever won the mirror match between Brandon and I would go onto win the tournament. It didn’t exactly play out this way, because upsets happen, but that’s what I was thinking as far as matchups go headed into the cut. I felt very good going into the top cut, as I had positive matchups against 5/7 other decks, and essentially a 50/50 against the other two turn 1 Item lock decks. I win the opening coin flip and go first in the first game. I play 3 Acro Bike and then 2 Trainers’ Mail, hitting nothing off the Trainers’ Mail and then quickly get benched out in the first game. In the second game, I go first get the turn 1 Vileplume for an easy win. In the third game he used Hex Maniac on the first turn of the game, which greatly hinders me from setting up. I started an Oddish, and use a pair of Level Ball to grab a pair of Combee and then pass. He takes a knockout on my Oddish, and then I promote Combee, evolve into Vespiquen, and then get a Vileplume out and knockout his Night March attacker. He had a Pumpkaboo on his bench with a Double Colorless attached and promotes that. He uses Lysandre on my Vileplume, and since he doesn’t have Dimension Valley in hand he has to attach a second Double Colorless to his Pumpkaboo and knocks out my Vileplume. He makes a mistake here and takes a VS Seeker from his prizes (after playing Town Map previously) instead of his fourth Double Colorless Energy with 3 copies of Puzzle of Time in the discard pile already, and the last of Double Colorless Energy #2 and #3 about to hit the discard as soon as I respond for a KO. This makes it so there is no way I can lose the game. Most likely I would have won even if he had taken the Double Colorless Energy, all I had to do was attach a Double Colorless Energy to my Combee and then find the Vespiquen and evolve. The tricky part would have been to get it without losing by decking out. I had put my cards back before we could check what the remainder of my deck looked like to see if this was true, but if I had an Ultra Ball in deck, which I probably did all I would have had to do was play some Acro Bike and then Trainers’ Mail to get the last Ultra Ball (or just draw into the Vespiquen) to achieve the winning game state. This game made me nervous as whoever won the coin flip would most likely win the series. I did have a bit of an edge in the mirror match because I had Lysandre which could be used to steal a game through non-conventional means, but that was a very small out and would most likely be a negligible factor on the game. I ended up losing the coin flip, but he missed a good turn 1 for the Vileplume. This worked out to be somewhat to my advantage since I prized 3 copies of Forest of Giant Plants, so it’s hard to tell whether I would have been able to setup my Vileplume or my Vespiquen to attack with if he didn’t already put a Forest into play. I got the response lock on my first turn and there wasn’t anything he could do and I got the upset win I needed to have a major advantage in the series, knowing that I would be going first in the third game. In the second game he whiffs the turn 1 Vileplume again and then I follow that up by whiffing the response Vileplume. He gets Vileplume out on the next turn of the game and I’m stuck with a less than optimal board state to deal with the lock. A lot of players would instantly scoop in this situation, but there isn’t really much of a reason as once he starts taking KO’s, the game will finish very fast, and there would definitely be time for game 3, so there is no reason to not keep on playing and see if there is any way to steal a win. I do have Lysandre in hand though, which gives me an out to potentially steal the game. He has three Double Colorless Energy accounted for (two in play, one in the discard pile) so I play Lysandre on his Shaymin EX and hope that his last DCE is in the prizes and that he will deck out. It’s not in the prizes, but it’s fairly low in his deck. I think he used Sky Return when he hits his last Double Colorless Energy, but he may have retreated straight into Bunnelby, I’m not sure, and used Rototiller to put two cards back in his deck. Immediately after he uses Rototiller for the first time, I AZ my own Bunnelby and knock out his Bunnelby with my Vespiquen. The way the game worked out is that if I promote non-EX Pokemon for the remainder of the game, he would not have enough turns to take all his prize cards before he decks out, so I promote non-EX, after non-EX until he decked out. I win the coin flip, which sets me up very well to win the series. In the first game, I get turn 1 Vileplume and easily win the game. In the second game, he goes first, and is able to thus setup more of a game. However, he doesn’t use a Hex Maniac on me, so I have an ample opportunity to get a lock on my first turn and have a good advantage in the game. I whiff the Vileplume though and he shows me his hand, and if I got the Vileplume I would have easily won the game as his hand was a bunch of Item cards. Instead, I have to go too many turns without the lock so he is able to establish a dominant board state and wins. In game 3, I go first and get Vileplume out on the first turn of the game giving me an enormous advantage. He almost loses the game instantly, but hits another Pokemon on the seventh card of his Professor Sycamore to keep going. It seems like every turn he is one thing away from losing, but continuously is drawing the one card to keep him alive in the game on the last card of his draws. He uses Hex Maniac and Lysandre to make it into a close match, but ultimately he runs out of resources and I’m able to take six prizes. One year after having lost in the finals I’m able to return and finish the job this time to become the Missouri State Champion. I just want to go over some other thoughts I have on the deck based on my own experiences with the deck and from what I saw other people playing in the deck throughout the weekend. 28 Pokemon is the golden number. Any time that you take out a Pokemon from the deck it only should be done so to put in another Pokemon. 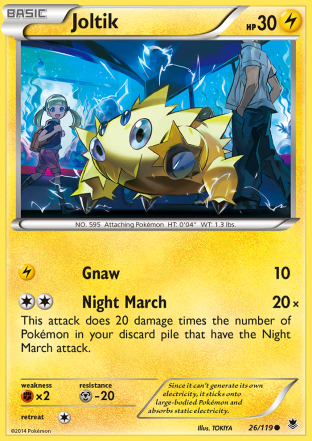 If you begin cutting down on the number of the Pokemon in the deck you will begin missing damage numbers needed for knockouts and will lose games as a result. For example, it took about every Pokemon in my deck to overcome the M Mewtwo EX (X) deck during the second round of the tournament, and if I wasn’t able to beat that deck there is no telling how my tournament would have ended up. If I were to play the deck again, I would likely try to fit Revitalizer into the list. I hadn’t given the card enough thought or testing prior to this tournament, but it seems very good in the deck allowing you to aggressively discard your Vileplume line and then recover it later, which can allow you to hit better damage numbers with the Vileplume lock. 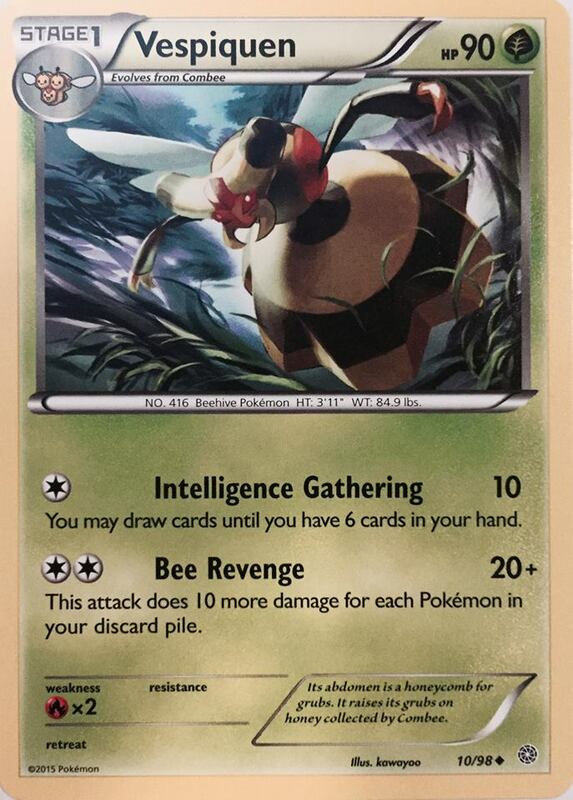 Additionally, you can use it to quickly get two Combee onto your bench or to recover Vespiquen that you had to discard early in the game before you hit a Forest of Giant Plants. It’s also great in those matchups where you don’t want Vileplume because if you need to, you can use Bunnelby to get back Energy, and then use the Revitalizer to recover a Vespiquen line. I’m not sure how it fits into the deck, but you likely cut from the Level Ball numbers to fit it in. I would think 1 Level Ball and 1 Revitalizer could be a good setup, but I also could see going without Level Ball and just playing 2 Revitalizer to be a possible play as well. I would have to test it first though to see how well those lines work. One good thing that this could do is allowing you to cut down to 3 Gloom while not hurting the consistency of getting out Vileplume much if you want to fit in a tech Pokemon. Toxicroak EX is a very good inclusion in this deck moving forward. 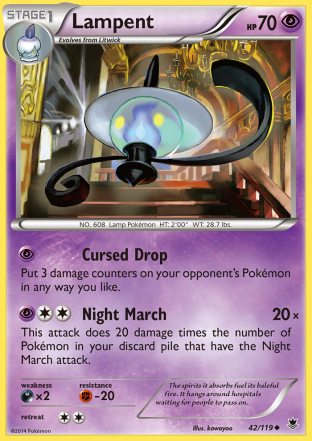 It gives you an out against Aegislash EX, but Brandon brought up a good point in that it can work as a very good attacker against Night March decks. Sometimes they will promote something like a Pumpkaboo without Energy allowing them time to set something else up. If they do that, you use Triple Poison, and then the Pumpkaboo will be knocked out going back into your turn, allowing you to Triple Poison something else for a knockout. If you were to take a KO with Vespiquen, then they could immediately respond with a KO on that Vespiquen, costing you a Vespiquen in the game. 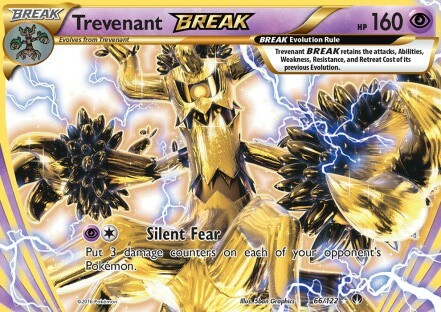 An additional Aegislash EX counter that Squeaky brought up is including a Silent Lab or two in the deck. 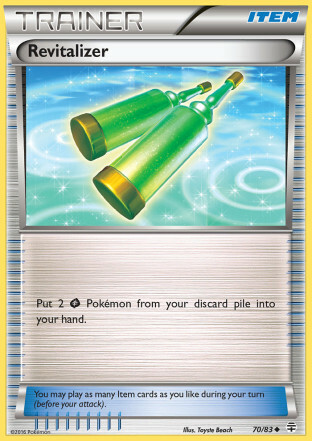 As seen by the Lysandre and AZ, they end up in your post Sycamore draw often enough to be well utilized in many games. I’ve also tested this Stadium split first hand in Accelgor DEX/Vileplume AOR decks leading up to Fall Regional Championships and City Championships, and the split worked well enough in that deck, so it should work well in here as well. Don’t carelessly discard your Forst of Giant Plants, they’re important for certain plays in the late stages of the game as well as by being a counter Stadium. 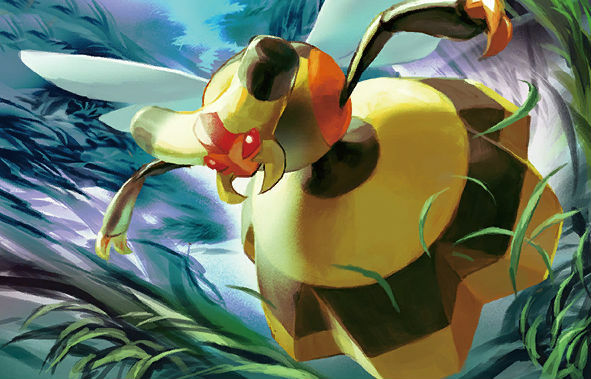 A common play you will make is to Rototiller a Vespiquen (or Combee) and a Double Colorless Energy. It’s hard to go through your deck without discarding a random part of a Vespiquen line now. And then you can use Forest of Giant Plants to evolve into that Pokemon in one turn to attack with it the next turn. 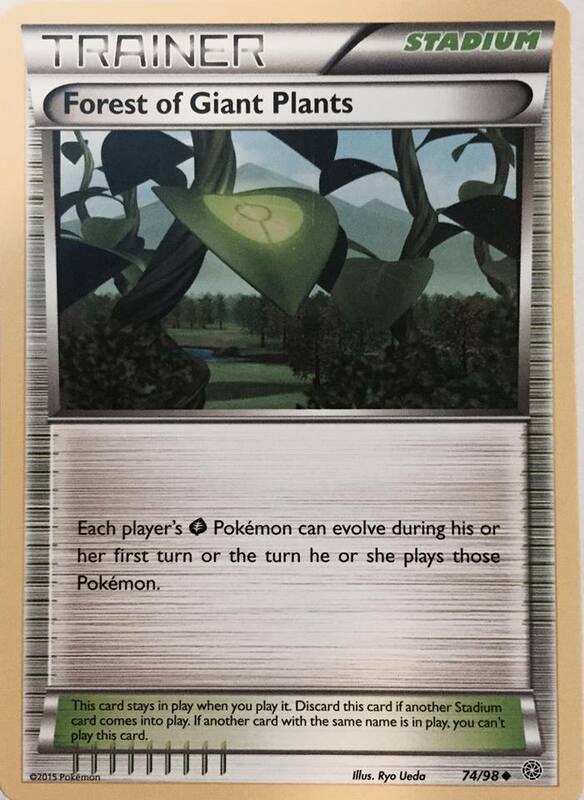 Against Night March, Forest of Giant Plants is important as a counter Stadium as if you bounce their Dimension Valley and they can’t replace it, they can miss turns of attacking by not being able to pay Pumpkaboo’s attack cost. It was very satisfying to not only win a State Championship, but win it with this deck. So many people have called the deck bad throughout City Championships and during the lead up to State Championships, but in reality their ability to play the deck was the only thing that was bad. The deck has a lot of very tiny decisions during the setup portion of the game that impacts the later stages of the game that a lot of players get wrong, and there are some big decisions you have to make in regards to your strategy in a given game based on what you’re drawing in your hand and what’s prized. A common mistake I see people make when playing the deck is going for the turn 1 Vileplume even though they’re overall setting up poorly or up against a deck where Vileplume is detrimental to them winning the game and instead they should be ditching the Vileplume line and trying to win the game as a turbo Vespiquen deck. Congrats to Squeaky for also taking first at the Mississippi State Championship as well as Brandon for taking third at Missouri with the deck, with his only loss being in the mirror match. The original version of the deck played at the Chicago Marathon was actually put together at Brandon’s mom’s house. With the State Championship win I am now at 359 Championship Points on the season and have clinched the points needed to qualify for my second straight World Championship.